Find the books needed to identify the artifact found in Saarthal. Make your way through Fellglow Keep. Find the three stolen books. Return the books to the College. After the discovery of the mysterious Orb in the depths of Saarthal, a puzzled Tolfdir decides to send you back alone to alert Arch-Mage Savos Aren. Aren turns out to be quite uninterested in the whole affair and sends you along to librarian Urag gro-Shub to research the subject, thus starting this quest. Locate Urag, who can usually be found behind his desk inside the Arcanaeum where he functions as the librarian and keeps a close eye on the College's huge collection of ancient tomes. After warning you about touching any of the books in the library, the old Orc will mention that there may be relevant information in one of three tomes which are no longer in his possession. They were 'borrowed' by an Apprentice named Orthorn who recently, due to a dispute with the College, joined a group of renegade mages in Fellglow Keep. Urag can do nothing for you without the books, and says you'll have to find Orthorn to retrieve the books so the research of the Orb can begin. On your way out the door you may be approached by Faralda who tells you that the Thalmor visitor, Ancano, wants a word with you. If you do not see Faralda, Ancano will actively seek you out and ask you questions about what was found in Saarthal. During this discussion you can choose to provoke him or not, but he will always get the answer he seeks. Proceed out the door and prepare for Fellglow Keep. Fellglow Keep is a large fort located between Whiterun and Windhelm. 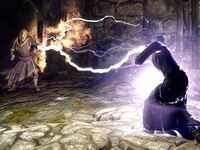 When you arrive it becomes clear that the residing mages are far from friendly as you will be attacked by two elemental mages and a flame atronach. Dispose of them and locate the entrance to Fellglow Keep Dungeons. Upon entering, head down the stairs and follow the path as it twists and turns. The second flooded room is guarded by another hostile mage who has been experimenting with frostbite spiders and will send them after you with the words: "Ah, a test subject! Go, my pets! Attack!" Fight the spiders and the mage, then proceed southeast and beware of the pressure plate triggering a dart trap along the way. Before long, you will arrive in a room filled with cages containing some very unusual prisoners, specifically leveled vampires. You can use the four handles to release them, or pick their cell locks, and they will cause havoc in the next room before leaving the dungeon peacefully. The next room reveals that several experiments were conducted on vampires as bodies are everywhere. Locate the northeastern tunnel and listen to the sound of wolves howling. In the next room are more cages and another hostile mage, seemingly another experiment chamber. Dispose of the mage and inspect the cages. Apart from the wolves, you will also find the renegade mage Orthorn, seemingly imprisoned by the mages he thought of as friends. As it turns out, Orthorn was imprisoned as yet another test subject by the mages, despite the fact that he came to Fellglow Keep to help them. You can choose to comfort him by saying Savos Aren sent you to rescue him, or you can simply be honest and say you are there solely for the books. In both cases, Orthorn will offer to help clear out the dungeon and find the missing books, so decide if you want him to tag along. Pull the lever in the middle and he will be released from the cage. He will proceed to explain that the books were taken by someone known as The Caller. If you accept his help you will have to put up with his comments for the rest of a very long trip, although he is a powerful conjurer and wields a lightning bolt spell. If you decline, he will head out of the dungeon peacefully. Regardless of your choice, he is disabled later on and disappears from the game. Unfortunately, the nearby door leading to Fellglow Keep is locked (key required), so you will have to take the long path. Go through the wooden door and make your way through the trashed tunnels. The next chamber has three fire mages training destruction spells on a living vampire in a cage, so be on your guard when they notice you. You can find a copy of The Legend of Red Eagle on the table in the middle of the room. Take the northern path and you will reach the undercroft, which is guarded by necromancers. There is a pedestal with a copy of Spell Tome:Raise Zombie just before the stairs leading to the next zone, Fellglow Keep. There is a small table at the end of the hallway before the stairs that has a coin purse and an easily missed Black Soul Gem behind a book. The first chamber of Fellglow Keep is guarded by a conjurer and an ice mage and has the Conjuration skill book The Doors of Oblivion on a pedestal. Open the eastern door and fight the patrolling necromancer, then proceed through the chambers and fight all the enemies in the room with multiple paths. A locked door (key required) leads outside while the eastern door leads to the sleeping quarters and more enemies. Check all the shelves for rare books, then head up the stairs. The room to the west holds an Unusual Gem so make sure to pick it up. Take the adjacent path and head upstairs to a room filled with shelves and the Destruction skill book A Hypothetical Treachery on a table. Proceed forward and make sure to check behind the closed doors for some extra loot. One of the doors is locked but pick the lock and find a shrine to Julianos and a wealth of ingredients. Open the wooden door to the north and start climbing the tower. Before long you will reach the Fellglow Ritual Chamber and an encounter with the Caller. You arrive in the ritual chamber right away and the Caller awaits you, right in the center. She will, however, remain calm and be strangely polite towards you: "So, you're the one who barged into my home and laid waste to my projects. How nice to meet you." While she is obviously insane, you will have two dialogue options to choose from; either ask her who she is or ask for the three books. The first option will make her respond, "Names no longer matter. You may refer to me as The Caller. Now, do you have a reason for making such a mess?" When you ask her for the books she will be disappointed: "So you're just one of Aren's lackeys? That's disappointing. You show real promise. You come here, kill my assistants, disrupt my work... You've annoyed me, so I don't think I'll be giving you anything." At this point it is actually possible to persuade her to let you have the books. Alternatively, if you brought Orthorn along with you, you can negotiate with her for the books. She will then say, "An arrangement? After you've destroyed so much? Fine. Leave me the elf. You may go with your books." You have to walk up to the Caller and start a conversation. Agree to her conditions, then pick up the book. If you simply pick up a book without doing this she will attack you. If you didn't bring Orthorn, she will say, "I'm afraid you don't have anything worth trading." Dispose of her and claim the three books (two of the books are behind the Caller on pedestals; lifting either will spawn a Flame or Frost Atronach, depending on your level). If Orthorn is still there, you can have a brief conversation with him which he ends with: "You'll be going back to the College, then? I, uhh... I think perhaps I'll wait a bit before venturing there myself. Let this whole thing blow over, you know. Give certain parties a chance to forget what I may have done. Still, you've gotten me out of that cage, and I won't forget it. Thank you again, and good luck to you." Find the exit and leave Fellglow Keep. You may still need to kill the Caller to obtain the key to the exit. 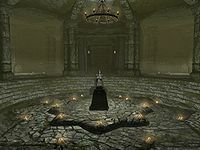 When you arrive back at the College, you will find that Tolfdir has returned from Saarthal and placed the Orb in the Hall of the Elements. Head into the Arcanaeum and locate Urag gro-Shub. Out of the three books, Night of Tears, The Last King of the Ayleids, and Fragment: On Artaeum, he will be particularly interested in the first one, as it has some interesting implications. The quest ends with him handing you a bunch of books as reward (see this section) and asks you to speak to Tolfdir. The next quest, Good Intentions, will then start. At stage 60 of this quest, the Eye of Magnus is invisibly moved from Saarthal to the Hall of the Elements. Tolfdir also returns to the College at this time, allowing you to start his quest. There is another book called Last King of the Ayleids. You need to find The Last King of the Ayleids. The text is the same, but the other book will not work for this quest. Mirabelle Ervine was originally supposed to play a part in this quest, at stage 10 and 20 specifically. For unknown reasons, she was skipped and Tolfdir now asks you to go directly to Savos Aren from Saarthal. However, the in-game text still describes the original journal intro including Mirabelle Ervine. There is a possibility that the stairway leading up to the Caller's room in Fellglow Keep is blocked off with boulders, and the door leading up to her room is removed. Enter coc FellglowKeep03 in the console to bypass the boulders. If you collect the books before talking to Orthorn he may not recognize it when you free him. Messing with the levers can eventually trigger a quest update for him being freed. If Orthorn is killed before reaching the Caller and she accepts your "Persuade" offer, the door to the exit may remain locked with a "Requires Key" status. Killing the Caller will allow you to obtain the key from her corpse. 10 With Tolfdir still occupied in Saarthal, I need to speak to Mirabelle Ervine to find out about researching the discovery in Saarthal. 20 Since Tolfdir is not available, I've been asked by Mirabelle Ervine to look into information on the object we found in Saarthal by talking to Urag gro-Shub in the Arcanaeum. 30 I've been asked to find more information on the object found in Saarthal. Urag suggested that useful books may have been stolen from the Arcanaeum by Othorn [sic], a former Apprentice at the College. His last known location was Fellglow Keep. 50 In attempting to track down books that may have information about Saarthal, I've been exploring Fellglow Keep and have located Orthorn, the former apprentice who stole the books in the first place. He's now a prisoner, and has begged me to free him. 55 I've freed Orthorn from Fellglow Keep, and he has offered to help me find the books I'm looking for. 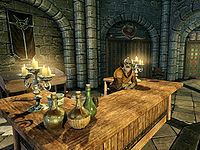 60 I was asked to find books that may have information about the object discovered in Saarthal, and traveled to Fellglow Keep to retrieve them from Orthorn, a former Apprentice at the College. I've found the books and now need to see them returned to the College. 200 Finishes quest I've returned to the College with the books from Fellglow Keep. One of the books, "Night of Tears", has some information about Saarthal that Urag found very interesting. Stages 10 and 20 are unused. On the PC, it is possible to use the console to advance through the quest by entering setstage MG03 stage, where stage is the number of the stage you wish to complete. It is not possible to un-complete (i.e. go back) quest stages, but it is possible to clear all stages of the quest using resetquest MG03. This page was last modified on 8 January 2019, at 21:58.